Francesca Messina first appears at Painesville, Lake County, Ohio, in 1916. She was six years old. Her mother, Caterina Graziano, and her three children immigrated to Painesville, Ohio, to join the family’s father, Tommaso Messina. 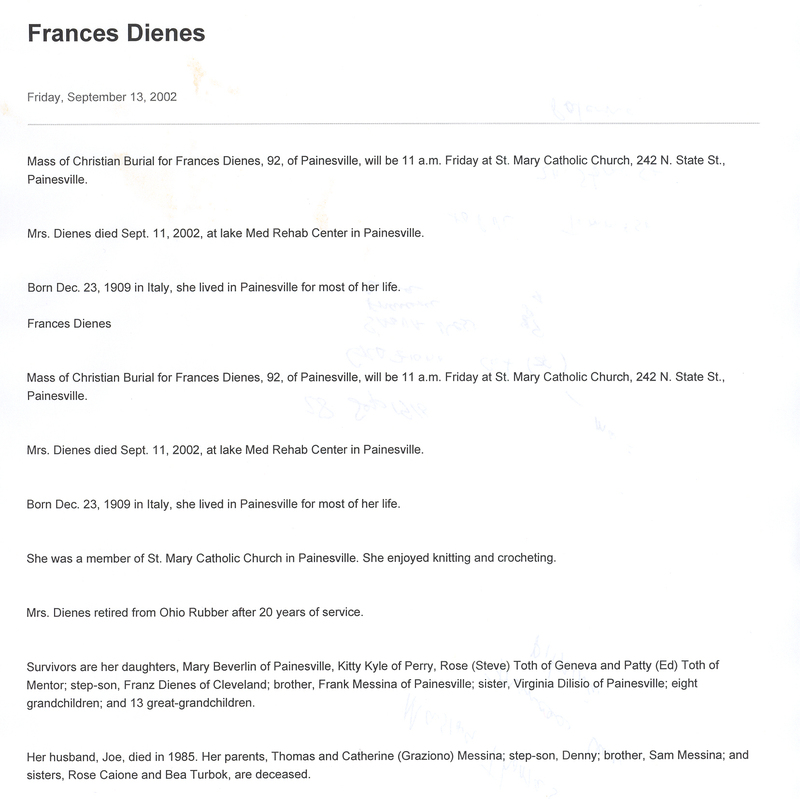 In America, Francesca Messina was known Frances Messina, then after she married Frances Parmigiano, then after she re-married, Frances Dienes. Francesca Messina, daughter of Tommaso Messina and Caterina Graziano, was born on Thursday, December 23, 1909, at Palermo, Sicily. Francesca married first, Michele Parmigiano, son of Vincenzo Parmigiano and Maria Petrecia, on April 3, 1935, at Cuyahoga County, Ohio. She and Michele Parmigiano were later divorced on January 21, 1952. Francesca married second, Joseph Dienes, son of Steve Dienes and Mary Komaty, on August 9, 1952, at Fairport Harbor, Lake County, Ohio. Francesca died on September 11, 2002, at Lake Med Rehabilitation Center, Painesville, Lake County, Ohio, at age 92. Her body was interred at Perry Cemetery at Perry, Lake County, Ohio. Francesca Messina immigrated to the United States on September 28, 1916, at age 6, travelling to 221 Storrs Street, Painesville, Lake County, Ohio. She was traveling with her mother and siblings, to join her father Tommaso Messina in Painesville. Frances Parmigiano became a citizen of the United States in 1945. Frances resided at 464 Henry Street, Painesville, Lake County, Ohio, when she was naturalized. There were no known children of Francesca Messina and Joseph Dienes.